It’s no secret that Netflix has seen tremendous success in its series of original programs since the first release of House of Cards in 2013. With productions ramping up again for the next season of shows, fans can expect some excellent content in the upcoming months. One of Netflix’s original shows seeing continued success is the college football docuseries, Last Chance U. Already on season 3 and going strong, Last Chance U is centered around JUCO (junior college) football teams and their players, highlighting their college lives as they progress through the ranks in the league. The catch, however, is that many of the athletes are actually drop-down players from Division I football teams who were removed due to academic or disciplinary reasons. The JUCO league is their last chance at returning to Division I.
Netflix’s Last Chance U is centered around JUCO league football athletes striving to regain Division I status. But aside from its inspiring plotline, Last Chance U is also known for being cinematically well-produced. Terry Zumalt, who has worked on films like Divergent and Straight Outta Compton, was camera ops for seasons 1 & 2, and now Director of Photography for season 3. For the past seasons of Last Chance U, the production team faced some major challenges. As a documentary focused around football, capturing every angle of a football game is critical to creating a good show. However, with the size of an entire football field, monitoring any of their 10 video cameras around the field was difficult. Terry Zumalt out in the field with Sony F55 and Serv Pro. Also, due to the nature of the show, filming could happen at any moment. The camera crew followed players as they went through daily college life, which meant that filming was 100% spontaneous aside from scheduled games and interviews. Setup needed to be quick and lightweight in order to capture the right moments - an important asset that was missing from the first two seasons. When Zumalt discovered the Serv Pro, it was an option that instantly clicked. Teradek’s Serv Pro is a camera-mounted device that allows for wireless monitoring on up to 10 iOS devices, which include iPads, iPhones and iPod Touches. 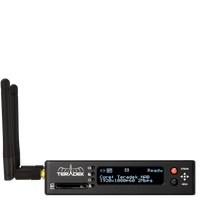 Connected to a camera via HDMI or SDI, the Serv Pro sends a feed to all iOS devices within 300 ft. (extendable by Teradek Link or third-party access points) which can be picked up by the companion app, VUER. Varicam LT with Serv Pro at the end zone captures all of the game highlights while the team monitors on iPads. For football game acquisition, 10 cameras in total are positioned around the field: 4x Sony FS7, 3 Sony F55, 2x Varicam LT and 1 FS5, 8 of which are mounted with a Serv Pro. To extend the range, every 2 Serv Pros are also connected to a Teradek Link, an industrial-strength wireless access point which gives the Serv Pro a max range of 1000 ft.
On the ground, Zumalt and his crew typically have 4-5 iPads on monitoring duty at any time. Using the VUER app’s multi-view feature, the crew members can load and monitor 4 simultaneous camera feeds at the same time, tracking each shot to make sure which camera is capturing the best footage at any moment. Monitoring on 4 iPad Pros with VUER, each using different viewing options to cover every angle. At the same time, for non-game footage, the crew carries 1-3x Sony F55 cameras each equipped with a Serv Pro. When Zumalt needs to suddenly film in buildings or dorm rooms, the Serv Pro allows the director, producers and other people to monitor from outside without needing to interrupt the filming. Having reliable monitoring on the production of Last Chance U is critical considering the spontaneous nature of the content. A documentary at heart, the series requires the production crew to shoot candidly, being ready to capture at a moment’s notice. This leaves little time for preparation that traditional productions have like setting up wired systems and testing out equipment before filming. Always stay in the loop on set through iOS monitoring with the Serv Pro. At the same time, the low cost and simple integration with their existing workflow compared to other monitoring systems make it extremely valuable for the production team. By being able to monitor so efficiently, Zumalt and his team are able to acquire the high-quality content that Netflix is known for.